How to Write a strong Event Sales Letter? 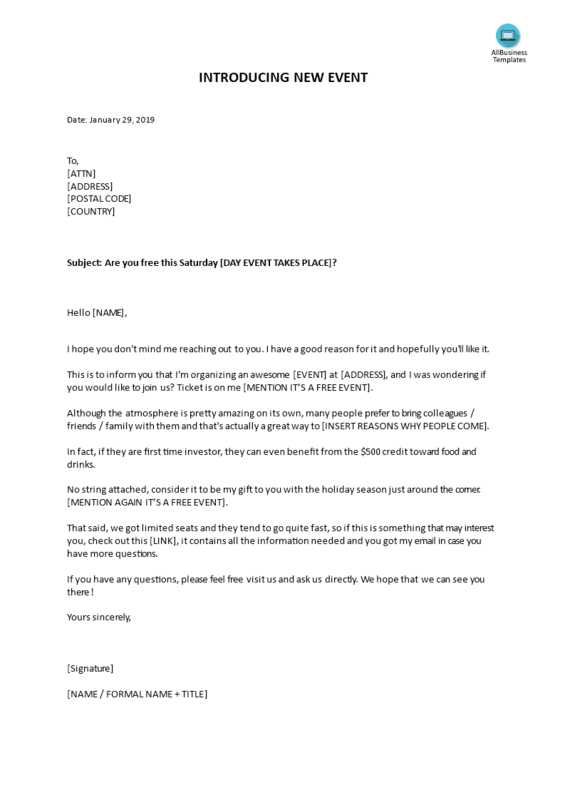 Download this example Event Sales Letter and impress your customers with a professional sales letter! Structured and written to highlight your strengths. Therefore we invite you to check out and download our basic or advanced sales templates. They are intuitive and in several kinds of formats, such as: PDF, WORD, etc. After downloading and filling in the blanks, you can customize every detail, visuals, typography, font size, and appearance of your B2B or B2C sales letter and finish in minutes. If you need a great sales letter and you can’t do it on your own you should use letter templates. Our Sales Letter templates guarantee that you will save time, cost and efforts and helps you to grow your business! Download this Event Sales Letter now! How to Write a strong Sales Letter? Check out these sample Sales Letter templates and impress your customers with a professional sales letter directly!